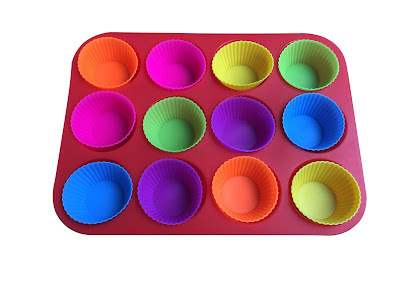 This silicone cupcake baking pan is awesome. This set comes with 12 silicon baking cups as well, for repeated use. It is eco friendly, you don't have to throw them away after each use. It saves money over time as well. 3. It is easy to clean and dishwasher safe. They are not only good for making cupcakes and muffins, but you can make gelatin candies and even chocolate treats. I have a great recipe for chocolate peanut butter cups here that you can use these silicone baking cups with. One thing to note, you will want to place the baking pan on a cookie sheet because it is flexible and will bend, spilling out the contents if you don't have it on a hard surface. They are only $12.99 when purchased together (the baking pan and the cupcake liners) making them a great bargain!